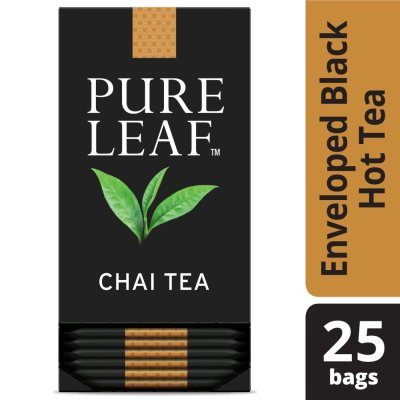 Treat your palate to a high-quality cup of chai tea with Pure Leaf Hot Chai Tea Bags. This exotic recipe combines a full-bodied mix of Kenyan and Ceylon black tea that is laced with an amalgam of spices such as cardamom, ginger, cloves, black pepper, chicory, ginger, and cinnamon. While typically enjoyed sweetened and with a dash of milk, this tea delivers a brew that is uniquely sweet and spicy – and yes, always heartwarming. Rainforest Alliance Certified black tea. The high-quality tea leaves are picked tea estates around the world, and are rolled and crafted to them to let their essence shine through. This chai tea comes packaged in pyramid bags, strings, and tags that are made from plant materials which are fully renewable and compostable. The envelope and carton are recycalable. For 1 cup: Infuse one pyramid bag in freshly boiled water for 3-4 minutes.